Introducers supplied sterile. For single use only. Available bulk upon request. Standard lengths are noted above. Other lengths available upon request. *SafeSheath® is a registered trademark of Pressure Products, Inc. 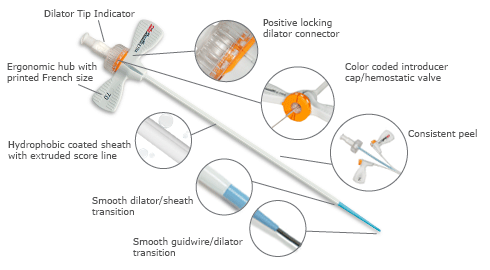 The Adelante® SafeSheath® Ultra Lite introducer sheath peel away system, features a specially engineered valve membrane that allows for reduced insertion forces during procedures.